Exciting opportunity to work for a fast growing company serving the needs of Fortune 500 and mid-market companies primarily throughout US. At NDS Infoserv we value team spirit and individual initiatives, innovative ideas and collaborative efforts. We are looking for BE/BTECH freshers to Join Our Energetic team. * Excellent problem solving skills and solution oriented attitude. 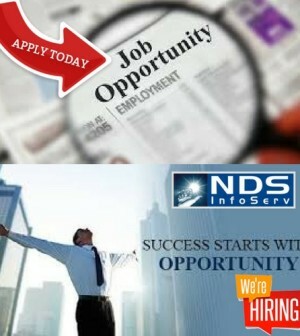 If you are interested then share your resume on interview@ndsinfo.com. Once your resume is shortlisted then will get back to you. Salary:INR 2,25,000 – 3,00,000 P.A. Company Profile – NDS offers a robust portfolio of business services such as engineering services, transaction processing and knowledge services across multiple industry verticals to mid size and Fortune 1000 companies. We believe in applying the rights mix of technology and process-engineering solutions to create offerings that help our customers increase their efficiencies and at the same time improve the quality of their products. NDS InfoServ offers the complete solutions for recruitment process outsourcing services to leading American companies.